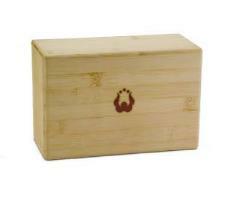 Pine yoga blocks are comfortable to use, light weight and sustainable. Constructed of "Environmentally Friendly" New Zealand Riata Pine. Forms either a pair of 1 lbs., 2 lbs., 3 lbs. dumbbells. Yoga, Pilates, Isometric Training, Cardio Weight Training, Strength Training. New Patented design. Great for travel fitness. New Zealand Riata Pine blocks; metal weights and bar; foam padding on bar. Wood tone finish. 5.5 in. W x 9 in. L x 4 in. H (17 lbs.) The Health Mark Body Tone Exercise Blocks, constructed of New Zealand Riata Pine, provides the best functionality of Yoga, Pilates, and Strength/Cardio Weight Training. Use the Wooden Blocks to increase the flexibility of your Yoga poses or Pilates and Isometric movements; and then use the adjustable dumbbells to perform Strength/Cardio Weight Training exercises. When the dumbbells are not in use, the foam padded dumbbell bars function as a center beam for the exercise blocks to provide a comfortable means of maintaining your wrists in a safe supine position, or use the "Easy Grip" function to suit your needs. The versatility of this item makes it a perfect travel companion. Details: Constructed of "Environmentally Friendly" New Zealand Riata Pine; Forms either a pair of 1 lb., 2 lb., 3 lb. dumbbells; Yoga, Pilates, Isometric Training, Cardio Weight Training, Strength Training; New Patented design; Great for travel fitness; Blocks 9" x 6" x 4"